Top choice: Which Comes First, Cardio or Weights? A wonderful page-turner crammed with no-nonsense summaries of the latest scientific research on 111 common (and uncommon) questions about fitness, training, health and nutrition… Why yes, I did happen to write it. But seriously, for readers who are new to Sweat Science: the book came out at the end of May, and aims to cover in greater depth and detail the kinds of topics discussed here on the blog. Read reviews here, check out the table of contents (which lists all 111 questions addressed in the book) in the sneak preview on Amazon, and find links to order here. 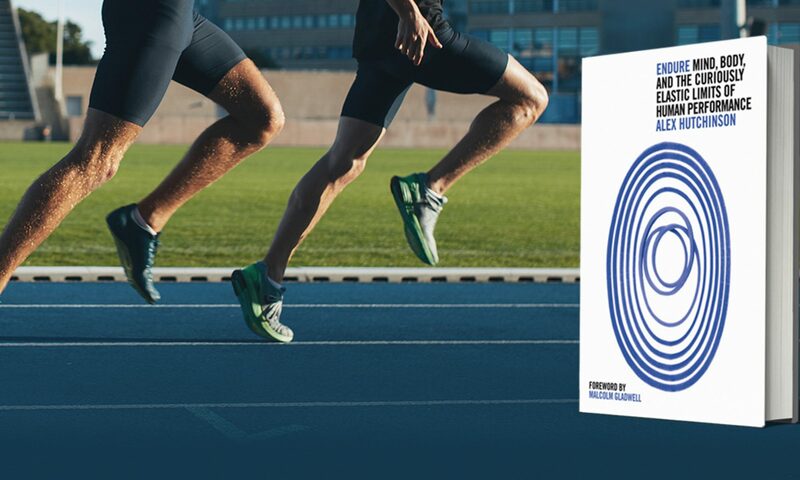 Blogger friends: Brian Martin of Running Technique Tips has a new e-book out called (surprise) Running Technique, which explores the theory and practice of developing good running form, along with plenty of suggested exercises and training methods. Brian is a thoughtful, balanced voice in the raging debate on what constitutes good form, so his thoughts are worth checking out. Also Jimson Lee of SpeedEndurance has a new book — well, actually, a new/old book: a revised edition of Bud Winter’s 1964 classic The Rocket Sprint Start on 1960 Olympic 100-metre champ Armin Hary’s legendary start, with Lee offering updates and comparison to the starts of the current crop of Jamaican sprinters. Totally unrelated non-fiction: While I’m at it, two of the best non-fiction books I read this year. Charlotte Gill‘s first-hand look at the culture of tree-planting in Canada, Eating Dirt, has been garnering award nominations left, right and centre (most recently the $40,000 B.C. Prize; also the Globe 100 best-of-the-year, and the Weston Prize). The nominations are well-deserved: captivating topic, beautifully written. And Andrew Westoll‘s new book, The Chimps of Fauna Sanctuary, was a total surprise to me: not a topic that I expected to grab me, but it did. Pick up a copy of either of these books, and you (or your giftee!) won’t be disappointed. Looking ahead: Okay, these books won’t be available this Christmas. But I was excited to hear recently that Pete Larson of Runblogger and Yoni Freedhoff of Weighty Matters have inked book deals. Among the sanest and wisest voices in the blogosphere — can’t wait to read the books. And lastly: Did I mention Which Comes First, Cardio or Weights? While my wife might quibble with the “sane” description, I do thank you kindly for your vote of confidence, and agree that your book makes a great stocking stuffer, dreidel surface, and answer to Kwanzaa’s Habari Gani greetings…..and it’s a great read to boot! Any chance of getting your book on kindle? I can’t be the only person that no longer buys physical books. @Chris: Thanks for the question! The answer is yes… and no… The book is available on Kindle both in the U.S. and in Canada. Unfortunately, the book hasn’t been officially released outside those countries, so I suspect the Kindle stores in the rest of the world don’t list the book (and I’m not even sure that the links I provided above will even show up correctly outside Canada and the U.S.). The terms of my contract with the Canadian and U.S. publishers mean that I can’t just sell the book on the side, in any format, to people in other countries. That being said, the book has been released in multiple e-formats (Kindle, Kobo, Sony, not sure what else). I’ve had a bunch of requests from international readers trying to figure out how to buy e-editions — and I haven’t been able to figure out any way for them to get the book (which, as you can imagine, pains me greatly!). So if anyone has had any luck figuring out how to do it (other than pirating it! ), please let me/us know. Ugh I’m so tired of these regional deals. They simply don’t maaesebse in the digital wwrrd. I’ll just download the book for free – if you and your publisher don’t want my money then that’s fine. The book is available in e-pub format, used by a variety of readers, and is in the US iBooks Store. @Penny: Thanks! Good to know. I can definitely vouch for the quality and enjoyment-level of the first and last book in the list! Not that I wouldn’t want to support you but I’m a little disappointed in the cost of the kindle edition. I should be saving a little money buying the kindle version not paying the same amount that it costs you get the one that has to be printed and shipped. Seriously, I share your annoyance. I got a Kindle last year, and so far I’ve bought a total of two books for it (*) — because I find it so incredibly annoying to pay the same (or sometime MORE) for an e-book compared to having the “real” book shipped to me. I think things will change dramatically over the next few years, but right now there’s still a big struggle between publishers and distributors about how revenue from e-books should be distributed. It’s not simple, because even though the marginal cost of an e-book is tiny, you still have to earn back the fixed costs like writing, editing, layout, indexing, publicity, and so on. If a publisher lowers the price of its e-books to $5, maybe it sells 10 times as many — but it also cannibalizes its paper sales and ends up earning less money overall. Not only that, but bookstores like Barnes and Noble who lose those paper sales then retaliate and order fewer copies of that publisher’s other titles, which means those titles struggle to get noticed… It’s a stalemate between multiple parties, but the current situation can’t last. For what it’s worth, though, I have no control over pricing of the book in any form. (*) I still get tons of use from my Kindle because it’s perfect for subscription to text-based magazines like the New Yorker, especially since I travel a lot and don’t want to cart around six back issues! But for books, the prices are out of whack.